Thank you for choosing Chelsea Financial for your insurance premium finance needs. 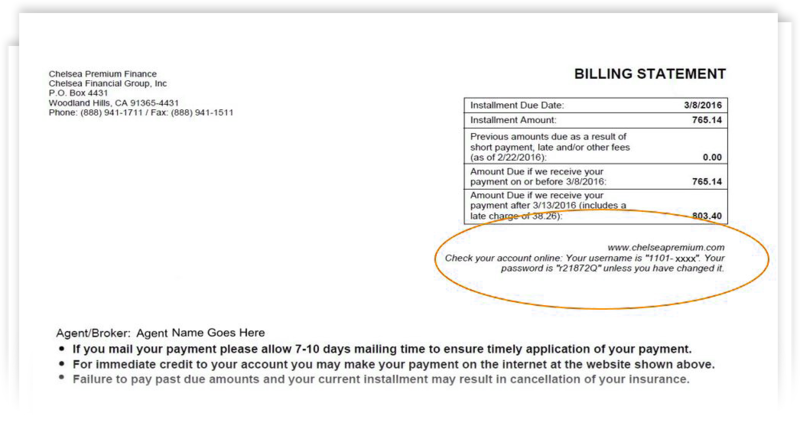 You will need your account number and temporary password, which are located on top-right side of your Billing Statement (see example below). Once you successfully login the temporary password will expire and you will be prompted to create a new password. Please note that the temporary password is case-sensitive. If you have not received your Billing Statement please call us at (888) 941-1711 or email support@chelseapremium.com and we will gladly assist you.